Prominent & Leading Exporter from Chennai, we offer designer wedding salwar kameez, trendy long anarkali salwar suit, crepe salwar dress material, party wear salwar kameez, salwar designer georgette with embroidered straight and traditional designer salwar. 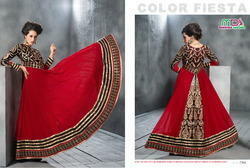 We are the Leading Supplier,Trader,Exporter and Wholesaler of Party wear salwar kameez in Chennai,Tamilnadu,Inidia. We are leading Supplier, Trader, Wholeseller and Exporter of Traditional Designer Salwar.It is due to our ability to meet the bulk orders that we have been able to gain a commendable position in this domain. The optimum quality of the offered dresses is maintained at all times through various quality assurance checks conducted our team of quality controllers.